I have always loved the famous image of the young Queen Victoria and family around their German Christmas tree. The image was printed in the London Illustrated News the Christmas of 1848 and is widely credited as starting the fashion for Christmas trees in England and America. Surprisingly, faux trees were popular during the 19th century, and most were made of wood and dyed feathers. If you have a Victorian dollhouse, this is a style you might like to imitate. 1. 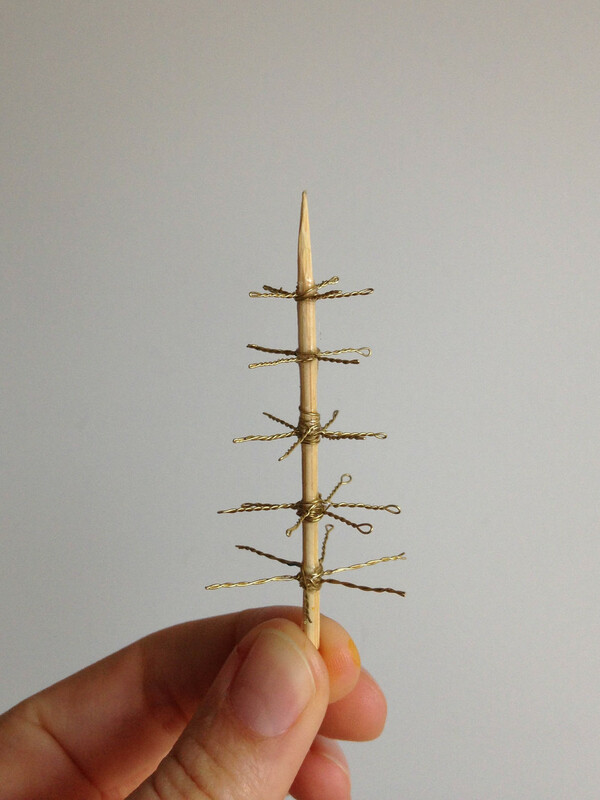 Sharpen a toothpick or section of skewer or small dowel to the length you want. Use the jewellery wire to create the branch levels. Once you are done with each level, dab a drop of super glue where the wire meets the toothpick to secure the wire to the tooth pick. I use super glue because it most effectively binds wire and wood. 2. 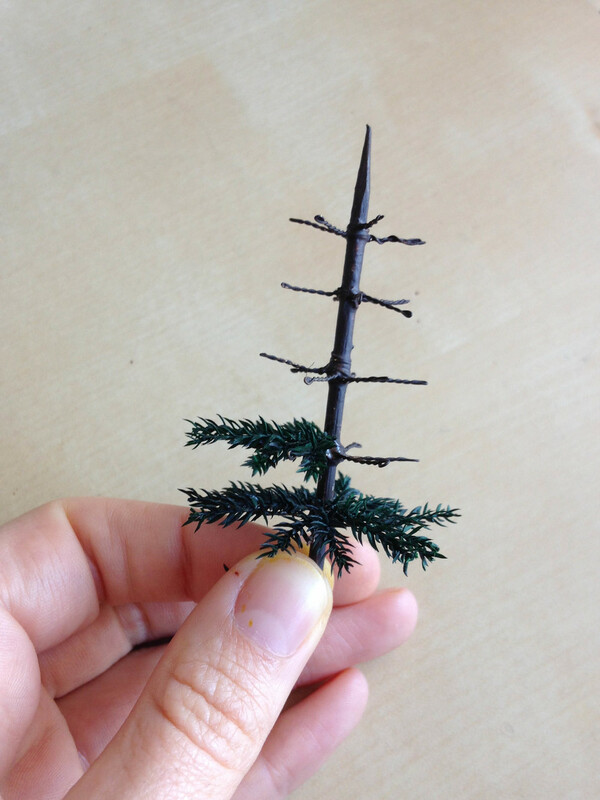 Paint the stem and wire branches brown, and allow to dry. 3. Use some lycopodium moss to make the branches. Cut the lycopodium in "Y" shape segments and glue each Y to one wire branch. This gives a "fuller" effect than simply glueing one single lycopodium branch to each wire branch. Using super glue, slowly work your way around the stem, gluing the Y branches on. This is a little bit time consuming and annoying in the extreme. But stick with it. The good thing about using the wire branches is that you can change their angle to get the look you like. 4. You must now make the stand/base by cutting two pieces of bass wood and creating grooves in them so they fit neatly together in an "X". 5. 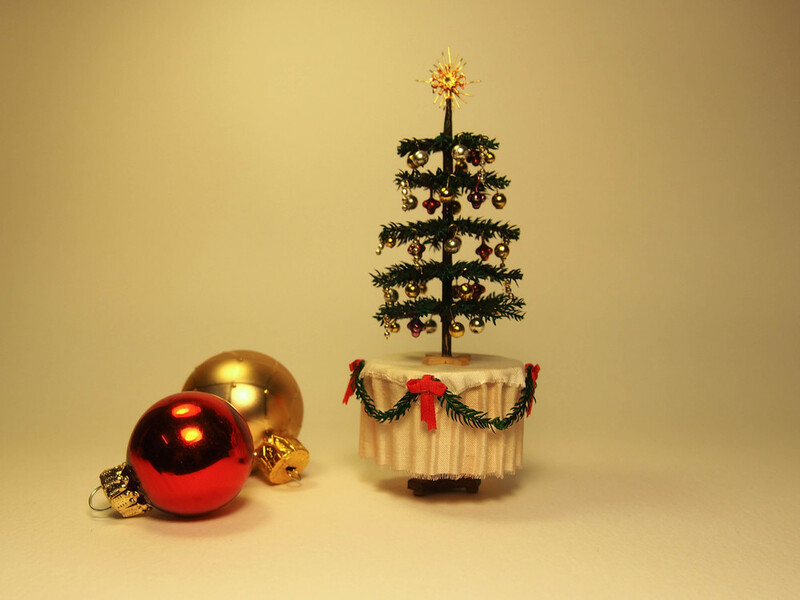 Glue the base to the bottom of the tree and you're finished! 1. Choose a selection of beads you like, and using the jewellery wire and pliers bend and cut the hangers for each "bauble". Cut the lengths slightly longer than you need because it is easier to trim excess than to fiddle with a tiny piece. 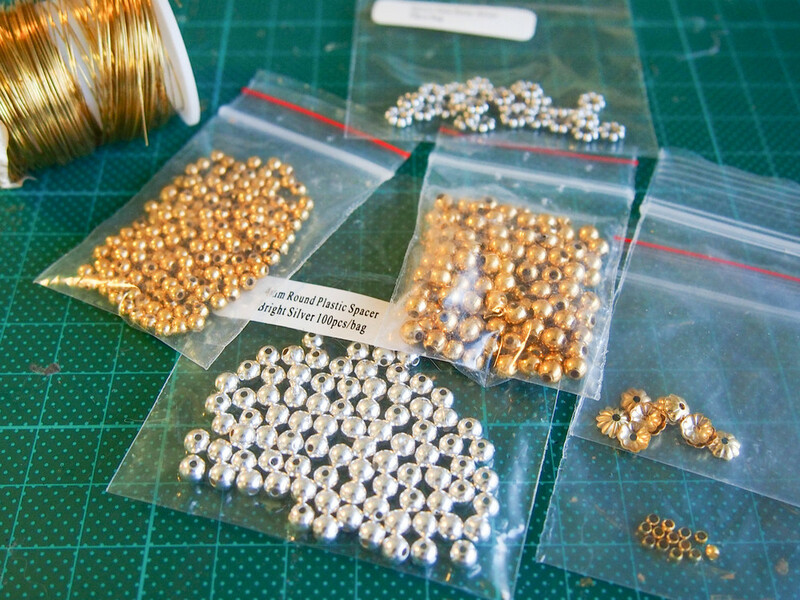 Glue the wire into the beads using super glue. 2. To make the star I used two gold bead caps. This type of bead cap is common and easy to find. 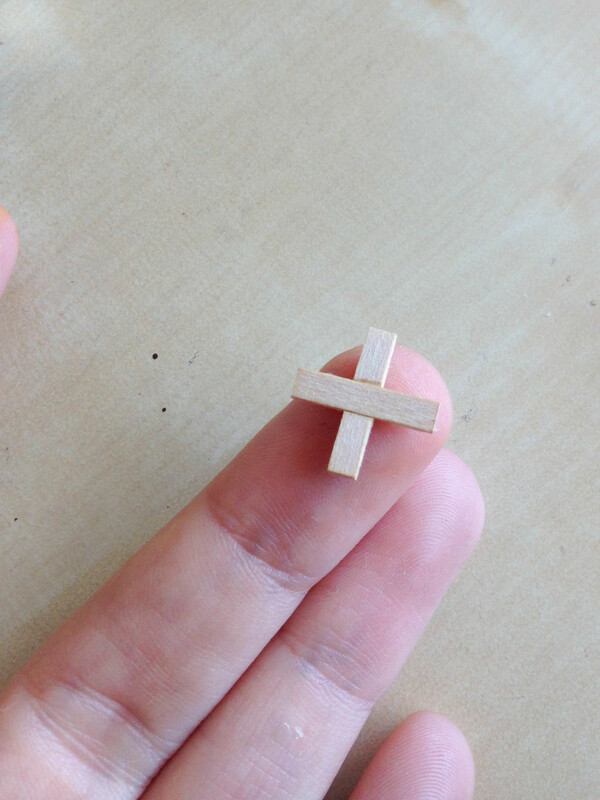 Many mini makers use them the base for 1:12 candle sticks. I cut one up to expose the centre star and glued it onto the top of the other. I then glued strands of the jewellery wire behind it for star shine. 3. Add some red highlights with glass paint if you want an authentic look. 4. Once the decorations are finished place them one by one in the tree. When you like their position, dab a drop of super glue on to glue them in place. Do the same with the star, and you're finished!